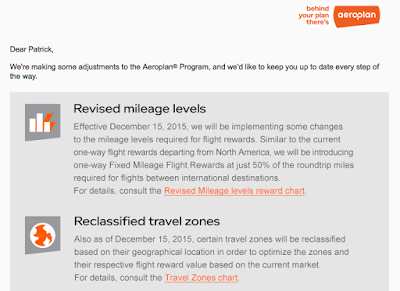 An email came out this morning from Aeroplan announcing more changes to their fixed mileage award charts. Over the past few years we have seen a lot of changes to the Aeroplan fixed (or what used to be known as Classic Flight) awards and thankfully, although this could be deemed a devaluation it isn't as bad as those past changes. The single change I see that would be considered the worst is the move of Canada to Europe 1 Business Class from 90,000 Aeroplan Miles to 110,000 miles! That award has always been a great sweet spot and I was planning on using it next spring so I think I'll definitely book that before December 15th now! A significant amount of awards from one international destination (not North America) to another international destination have decreased in cost. Intra Asia business class sees the biggest jump of all! Asia 1 to Asia 1 goes from 30,000 miles to 80,000 miles! Ouch! Here is a look at the changes for those of us who primarily travel within or from Canada. The black dot represents increases. No dot means they stay the same and an orange dot represents a decrease, which you'll only see on the linked PDF below this chart. 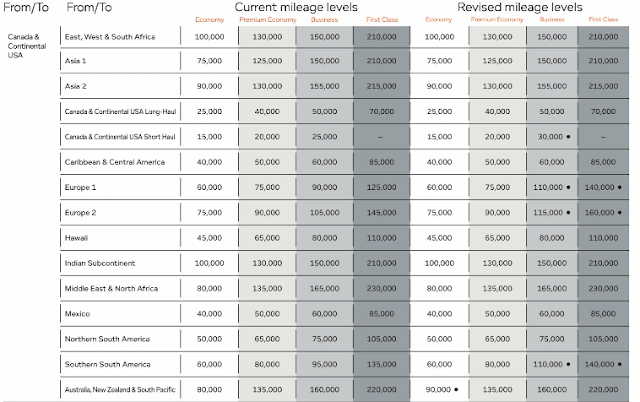 You can find a comparison chart of all the current and new mileage levels on the Aeroplan site here. 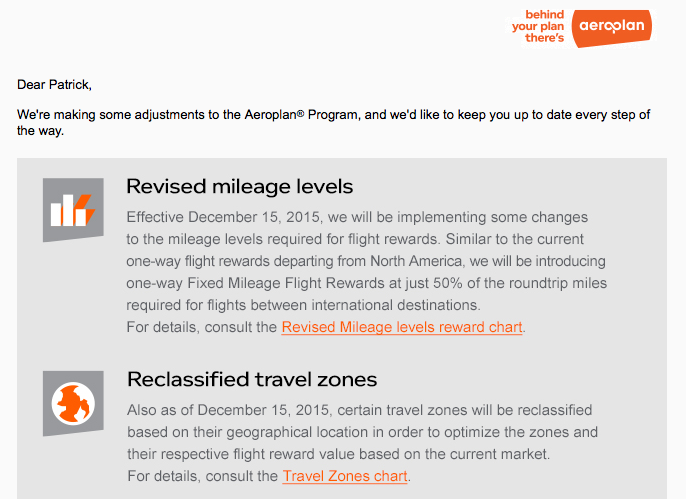 Overall this isn't huge breaking news from Aeroplan like past program and award chart changes. I think the biggest hit and issue a lot of Rewards Canada readers will have is with the big increases to Business and First Class travel between Canada and Europe. Really though, Aeroplan is just playing follow the leader with these as we saw British Airways increase the amount of Avios required between Canada and the UK or Europe as well as with United when redeeming MileagePlus miles on Air Canada flights. Not happy about it personally but this is the landscape that is now. 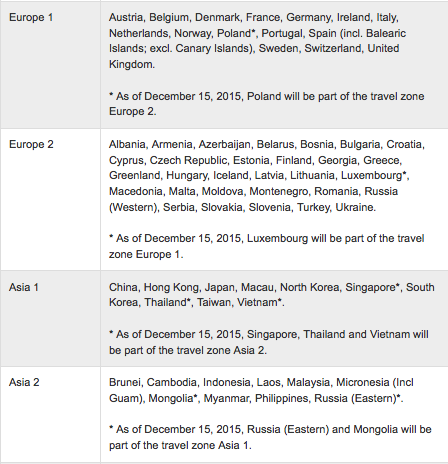 Like I said I am going to redeem for our planned Canada-Europe 1 flights before 12/15/15!